More children are enrolled in child care programs that meet or exceed the state’s proficiency standards than in the past. Yet access to high-quality child care options varies greatly across Wisconsin. Milwaukee County, which has the most providers and most children in child care, has a lower share of children enrolled in high-quality programs than the statewide average, but has gained ground in recent years. Statewide, the Wisconsin Shares Child Care Subsidy program helps more than 20,000 low-income families afford child care. 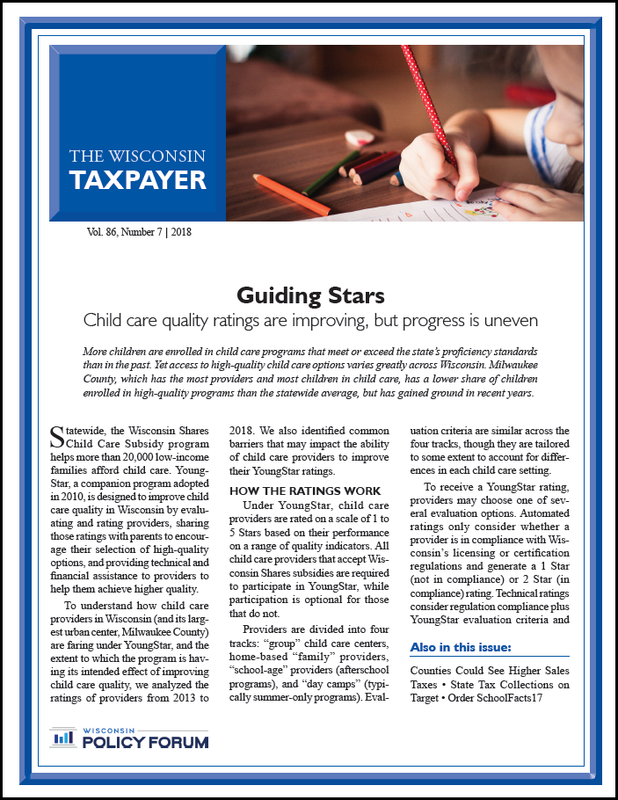 Young-Star, a companion program adopted in 2010, is designed to improve child care quality in Wisconsin by evaluating and rating providers, sharing those ratings with parents to encourage their selection of high-quality options, and providing technical and financial assistance to providers to help them achieve higher quality. To understand how child care providers in Wisconsin (and its largest urban center, Milwaukee County) are faring under YoungStar, and the extent to which the program is having its intended effect of improving child care quality, we analyzed the ratings of providers from 2013 to 2018. We also identified common barriers that may impact the ability of child care providers to improve their YoungStar ratings.